The bread fairy always calls thrice at The French Laundry. First, arrives a beautifully glazed brioche bun. It’s got Lana Turner’s curves with the coloring of Sophia Loren after a summer on the Riviera. Then, a basket of mini baguettes and whole-grain wonders, all of which I overlooked in favor of the pretzel roll with its shiny, elastic skin and salt freckles. And finally, you’ll graduate to the sliced selections, studded with dried fruits and nuts. These go well with your cheese course towards the end. Of course, if you spring for the foie gras supplement, you’ll also get a second helping of brioche – this one a toasted tranche of leavened air made entirely of butter. It’s the kind finely crusted wonder that leaves you orbited by a halo of crumbs, a holy aura of the golden-brown and delicious variety. Linger a couple of minutes and a fresh slice arrives, warm. If you’re anything short of indulgent, this carb-tastic excess will leave you curating a fine collection of half-eaten bread. The variety is just too great. Don’t forget the butters – one from those famous dairy cows in Vermont, the other from dairy cows in Petaluma, California. 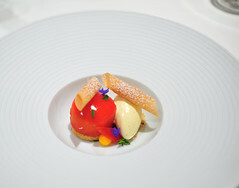 This is just one example of how The French Laundry pampers, cossets, and overwhelms in the most unbelievable way. Fate brought me back to The French Laundry. The restaurant wasn’t included in my original plans. In fact, I had no intention of leaving the city at all on my recent visit to San Francisco. As far as a month and a half before my trip, all of my reservations had been set; all of them in the city. I’ve been pretty honest and outspoken (maybe a little too much so) in the past about what I think about the food that has come out of Keller’s kitchens and the kitchens of his restaurants’ alumni. Precise but soulless has been my conclusion (some might characterize it as an indictment). But this latest meal at The French Laundry was different. It was, if not soulful, immensely satisfying. I can’t say that I loved every dish that I tasted that night, but I can say that, overall, the food was adventurous, playful, and full of wit. It brimmed with so much personality that the impeccable execution of the dishes seemed less the focus, rather the icing on the cake. 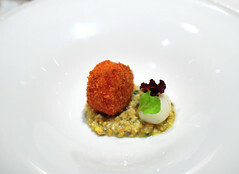 At its best, the food was indulgent, delicate, beautiful – ingenious. Coupled with excellent service, the entire experience was magical. And I’m not saying this simply because my friend and I found an empty ledger on the tab at the end of our meal (more on this later). So, who is this young Texan who dazzled me at The French Laundry this time? At the age of 30, Timothy Hollingsworth has already collected a list of accolades that would put most established chefs to shame. At 28, he represented the United States at the Bocuse d’Or in 2009, placing sixth – tied for the best showing our country’s had at that prestigious, international culinary competition. At 29, he ascended to top toque in Yountville, succeeding Corey Lee as chef de cuisine of The French Laundry. And earlier this year, I saw him accept the coveted title of Rising Star at the James Beard Awards in New York. I knew, even before I arrived at The French Laundry, that Hollingsworth wouldn’t be in the kitchen that night. On a pit stop at Bouchon Bakery before our dinner, I spied him sitting out on the patio of Bouchon with his friends. But this bothered me little. I assumed that the menu would be his, and was assured that the restaurant would ultimately stand on the merits of the team he trained and oversaw on a daily basis. If he was truly that good, so too would be his cooks. Halfway through our meal, the maitre d’, Larry Nadeau, offered to take me into the kitchen to meet Devin Knell, the very capable executive sous chef and acting chef de cuisine for the night. My dining companion and I decided to each order a different menu and share our dishes. She ordered the “Tasting of Vegetables,” I the “Chef’s Tasting.” Each menu came with a few choices. 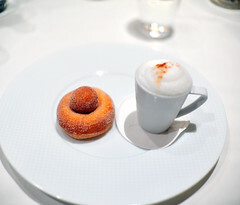 Other than requesting that the signature “Coffee and Doughnuts” dessert be added to her menu, my dining companion left all of her choices to the chef. I was a bit choosier. As between the “tête de cochon” and quail, I wanted the former. As between chocolate and peaches, I wanted the latter. And, could I swap out my cheese course for the Italian blue on the Vegetable Tasting? Yes, of course I could. I left the remaining two choices up to the chef to decide. My only other request – which I had called in a few days ahead – was that the first course on the Chef’s Tasting – Keller’s famous “Oysters and Pearls” – be replaced with something else. Crème fraîche and sesame tuile. Mission fig, Sicilian pistachio “nuage,” and rosemary essence. Meyer lemon granité and white sturgeon caviar. Fennel bulb, Niçoise olive, arugula, and basil yogurt. Radish, watercress, and black truffle. Warm brioche and a flight of salts. Perilla shoots and bonito gelée. Red radish, Hawaiian hearts of palm, and cilantro oil. Pickled onion, raisins, Marcona almonds, and fennel bulb. Summer squash, jingle bell peppers, parsley, and sweet garlic pudding. 48-hour brisket, fingerling potatoes, petite lettuce and horseradish crème fraîche. Roasted Belgian endive, toasted pecans, grapes and verjus. Blu del Moncenisio cheese, Asian pear, pickled cauliflower, and red wine reduction. Summer melons, “Moscato d’Asti” and garden mint. Goat’s milk mousse, Bing cherries, Thai long peppercorns, and cassis sorbet. Santa Rosa plums, pine nut nougatine, and Tahitian vanilla bean-basil ice cream. Whereas I would say that the Chef’s Tasting was, for the most part, satisfying and solid, with a couple of particularly stunning courses, the Vegetable Tasting was utterly inspired. Let’s just assume that everything was properly cooked and plated (because, unless otherwise noted, it was) and focus instead on the highlights. 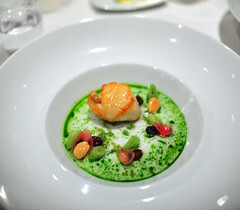 From the Chef’s Tasting, the New Bedford Sea Scallop “Poêlée,” was, by far, my favorite course. Forget for a second that the scallop was predictably well-cooked, glistening with the beurre monté in which it was rested. Consider, instead, the wonderful collection of flavors and textures that came with it. There were meaty, marinated raisins; crunchy Marcona almonds; and crisp, pickled onions, all of which were tied together with a slightly sweet, emerald-green sauce perfumed with fennel. Exquisite. Keller’s signature calotte – the cap of the ribeye – was the ultimate beef experience (Snake River Farms “Calotte de Boeuf Grillée“). This same cut of meat from Snake River Farms was served the first time I ate at The French Laundry in 2006. This time, it seemed even juicier, more flavorful, and more tender than before. The marbling was mind-blowing. A perfect meeting of excellent product and excellent technique, it was an illustration of how the food at The French Laundry, at its best, can be so simple, yet so spectacular. That plate could have arrived with that strip of meat alone without fault. And a beautiful half-dome of Frog Hollow peach, pitted and glazed, was as soft as custard, as sweet as nectar (“Peaches and Cream“). Paired with rich vanilla bean ice cream imbued with basil, and a wonderfully fragrant pine nut nougatine, this dessert was breathtaking in every respect. What made the Vegetable Tasting so amazing was the unexpected level of complexity that Hollingsworth was able to achieve in what seemed like rather innocuous compositions. The highs on this tasting menu were higher and more intense than successes elsewhere. 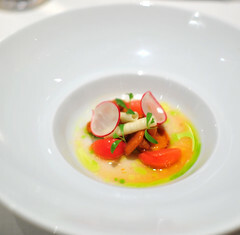 The “Salad of Toybox Tomatoes” was stand-out. Deceptively precious, this colorful assortment of gems offered a tremendously complex dialogue of sensations. Lightly pickled, the tomatoes burst with a surprising amount of flavor. With crunchy crystals of candied ginger, dots of white sesame emulsion, and nubs of demi-sec tomatoes, this salad not only appeared in technicolor, but tasted technicolor. Sweet Onion “Flan” achieved an exciting world of flavors in a simple gathering of four or five ingredients. 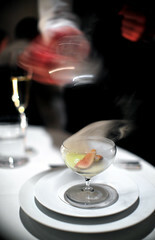 The dramatic presentation aside, the quick smoking of the figs added a layer of welcomed sophistication. 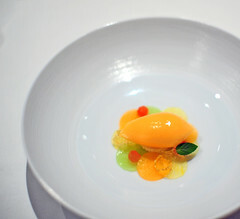 And the Armando Manni Olive Oil Sorbet? Creamy, rich, floral, buttery, peppery – n.b. it is a sorbet. The muscavado “genoise,” aged balsamic, and gin gelée accentuated the extra virgin olive oil’s darker side. Amazing. But, as I suggested above, the meal wasn’t entirely flawless. I thought the lemon granité in my caviar course was a bit abrasive. The acidity overwhelmed both the delicate tofu “panna cotta” and caviar (Hokkaido Bean Curd “Panna Cota”). The shaved ice also numbed my tongue to both flavor and texture. That’s no fun when you’re showcasing something as luxurious as caviar. And, I normally love the saliva-inducing marriage of salt and acid, but the “Chanterelle Mushrooms ‘Á La Grecque‘” were a bit too acidic and way too salty. Á la Grecque as a condiment, perhaps; but à la Grecque as a dish – too aggressive, too much. Pity, because the mushrooms were otherwise perfect – tender, silky, excellent. I wish I could have tasted them. 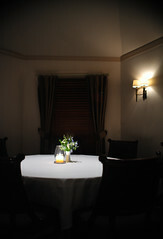 Service, however, was spotless, and, for once at a Keller top table, I was put entirely at ease. Guillaume, our affable server, and the rest of the staff seemed to appear and fade seamlessly along with our food. Pacing was perfect. Like clockwork, the interval between each succeeding course seemed to lengthen by just a hair, allowing for digestion to work its magic. The meal started with two flutes of Champagne, compliments of the house. It ended with strong coffee. In between, my dining companion enjoyed a half bottle of white wine chosen by the sommelier – the Nigl Riesling Privat, 2007. There were snacks fore – a duet of cornets, gougères twins – and aft – assorted chocolates; those famously crunchy caramelized macadamia nuts; and, appropriately, from a kitchen helmed by a gourmet Texan, mini pecan pies kissed with BLiS maple syrup. There are many chefs who can execute and cook food flawlessly. Timothy Hollingsworth and his cooks are clearly among them. But what sets chefs like Hollingsworth apart is the ability to create a galaxy of flavors in a heavily edited roster of ingredients, and do it all with a dash of wit and creativity throw in. Machines may be able to replicate with precision more consistently than humans, but humans have the blessed ability of stirring emotions, creating meaning, developing rapport. Given a choice between the two, I’ll take personality with a side of perfection. And that’s exactly what I found this time at The French Laundry. Hollingsworth’s food isn’t just haute couture on a plate – a finely hemmed pageant to be strutted across the table and then forgotten. His food shares with you a sense of place, time, and persona. It made me want to eat and discover more of his cooking. I will remember it. Distracted by the entertaining birthday four-top left sharing the room with us at that late hour, I didn’t notice my dining companion fumbling with the bill for quite some time. I handed her my credit card without much thought. She turned to me. There must be some mistake. The only thing listed was the half bottle of wine she ordered. Wherefore this unexpected benevolence? I haven’t a clue. It’s the second time this has happened to me at a Keller restaurant, and I sincerely hope it will be the last. To chefs Keller, Hollingsworth, and Knell, and the staff of The French Laundry, many thanks. You are truly a class act. * Originally, I was supposed to have dinner with three friends at aziza, Mourad Lahlou’s Cali-Moroccan restaurant in the city’s Richmond district. I had, regretfully, missed it on my last trip. But, a few weeks before I left for San Francisco, aziza called to inform me that there had been a mistake and that the restaurant was closed the night I had a reservation. Unfortunately, they had to cancel it. Left scrambling for a last-minute reservation, one of my dining companions urged me to ditch the city go with her to wine country instead. Unfortunately, this meant that the other two wouldn’t be able to join us for dinner. But they urged us to go without them. I had lunch with them instead. The French Laundry didn’t occur to me at all. That is, until a couple of encouraging reports from lizziee at Refined Palate piqued my interest in Timothy Hollingsworth’s cooking. I called on a whim and, as expected, was put on the waiting list. I emailed a few friends who had been to those restaurants for their advice. A consensus achieved, I made a reservation. 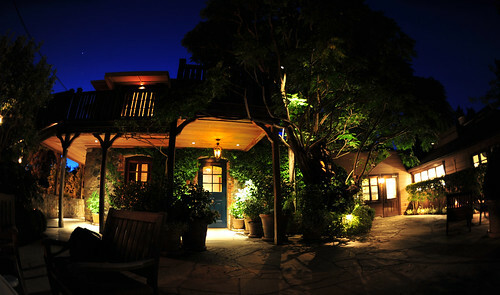 I had all but forgotten about The French Laundry when the restaurant called a little over week before my trip. There was a cancellation. And, apparently, one of my good friends – a chef and very good friend of Hollingsworth’s – had called the restaurant on my behalf. To him, I owe a big thanks – you know who you are, and I will get even with you. ** But wait, there’s more: when I received my credit card statement, the price of the wine that I split with my dining companion wasn’t charged to my card. Only the tip that I left was run through. ~ by ulterior epicure on September 11, 2010.
don’t get me wrong, I love The French Laundry. And your photography has really achieved a new level of success over the past few months. but do you think you can accurately evaluate a restaurant where you’re known to the house and get comped (and not just a little, like $500+)? @collegecritic: First, thanks for the compliment on the photography. As for your question: Well, I certainly think I’m capable of fairly evaluating this meal, despite the comp. I see no sense in fibbing my opinion – it would be a disservice to the chef, the restaurant, the readers of this blog, and my personal integrity. If I were going to sell out, I’d do it with style – glow and gush, use superlatives at every turn. I wouldn’t tell you that I didn’t love everything, single out the dishes that I found flawed. If the meal were THAT bad, I would just refrain from posting about it altogether. It is simply irony that the one time I experience a truly magical meal at a Keller top table, they decide to show me this type of unexpected generosity. If I am known to the house at The French Laundry, it was not of my doing. I was just as shocked as anyone else would have been at what happened. I count it as a tremendous privilege and honor that they did this for my guest and me. But, since the value of my opinion is being put into question, the above answer is useless. Ultimately, you must decide whether or not my opinion is to be trusted, given the circumstances. While I’d agree that a comped meal can paint it with rose colored glasses, I don’t feel that it is always the case – especially if fully disclosing the fact. Excellent review and agreed on the photos – especially at The Laundry. New camera, better editing, or otherwise? @uhockey: Thanks for the compliment on the photos. Are they really THAT much better than before? (You’re like the hundredth person to ask.) No new camera. No extra editing. Just very good lighting. I personally found TFL quite difficult to photograph in. Your equipment trumps mine by miles but even so your shots from this trip are cookbook quality. I’m not questioning your integrity or the value of your opinion necessarily, but I do think that the comp definitely impacts your recall of the meal, if only on a subconscious level. Elizabeth Loftus has done a lot of great work on distorted and false memory recall, particularly in the context of eyewitness testimony. I firmly believe that every aspect of the period between encoding and recall impacts the eventual recall. Disclosing a comp, while an ethical imperative, doesn’t alter the cognitive effects of receiving the comp in the first place. Only a master of metacognition could extract a pure memory and then analyze it and record that analysis with fidelity. The times I’ve written about restaurants that tried to comp me, I refused the comp and did my best job of exerting executive control over my encoding process. I doubt that I was wholly successful. In my opinion, certain techniques like purposefully telling everyone that you didn’t love everything and singling out flawed dishes only rationalizes the integrity of your judgment. Maybe you only chose to write about those particular flaws because the comp nagged for balance at the back of your mind? I don’t know. You don’t know. Only deeper layers of processing in your mind could reveal the answer. I value your opinion, since I’ve read your blog for quite a while and use it as a reference point for some of my own restaurant adventures (ie Jean Georges). But I do think some of your assumptions regarding criticism are fallacious. Perhaps this derives from my current disenchantment with restaurant reviewing as a whole. @collegecritic: Fair enough. I don’t like getting comped for the very reasons you state. It causes an added layer of doubt among readers, if not the writer. I can only tell you that I was pretty chuffed about the food during the meal, before the bill arrived. But, I suppose my dining companion is the only one who was privy to my table-thoughts at the time. Regardless, thanks for being a regular reader here. I’m glad you’ve found this blog of some value. @collegecritic – then don’t read it as a proper “review” per se – just read it for what it is – a point in time where a chef delivered an excellent meal. Is it fair to theorize that the reason some gastronomy restaurants comp meals for diners when they are either solo diners or people with serious cameras, is that they feel these diners are more likely to be critics or prolific bloggers? in my opinion and experience, your claim isn’t a theory, it’s a truism. I think the real problem with writing about this meal isn’t that you’re going to write something biased about it, but that a regular person won’t get the same meal if they walk in the door and pay their $1000 or whatever it would have cost. Keller restaurants treat people known to the house much better than they treat regular people, or at least regular people who don’t spend more than a few hundred dollars a head on wine. I’m sure you had a great meal, but it’s not one that I can get by walking though the restaurant so reading this will have no impact on where I choose to dine. This isn’t really a criticism of you as much as it is of the restaurant, you seem like a nice person and I’m glad you had a nice meal. 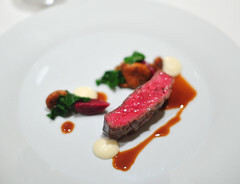 Reading about the meal that Shaw had at Per Se turned my stomach. AaronS, what review of per se are you referring to? 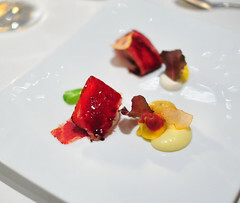 @M: AaronS is referring to my meal at per se in 2008 (a link is provided in the penultimate paragraph of this review). @M: n.b. I have never eaten with Steven Shaw. The link above is to my meal at per se, not Shaw’s. I was referring to a write of a meal of Per Se that I saw on Egullet, not the meal that UE wrote up in 2008. I’m sorry if that wasn’t clear from my comment, but I think it should be. Thanks, I appreciate the clarification. Note: Please welcome Chuck to the discussion. His comment languished in the SPAM filter for far too long (see above). I went with 3 other people. I ordered the taste of vegetables, and they ordered every combination of the chef’s menu. Since I have the biggest appetite of all, I got to eat & finish almost all available courses of the night (except the toybox tomato salad, which my dad finished before I had a chance try it…pity). Yes, most dishes are great and ‘satisfying’ (with a few bad ones) but like you, two of my favorite two dishes were the sweet onion flan and the olive oil sorbet (I also loved the avocado cornet). The creativity put into the flavoring is just amazing. Regarding the Chanterelle mushrooms…yes, I also thought the mushroom and sauce were extremely sour, but I found that just by adding the little herb on the side (I forgot to ask the name of the herb), the mushroom becomes pretty good. Not a food that I love, but I feel this is quite a genius combination of flavors, especially after first disliking the sourness. They put barely enough herb per to go with each mushroom. BTW, the toybox tomato salad was that good huh? I had the similarly laid-out compressed melon salad. The taste was interesting, but each item was simply too tiny for me to really appreciate the flavor. We went to TFL for the 1st time less than a month after your 2010 visit. I was very impressed with the service and the courses (my husband had the vegetable menu, I had the Chef’s). Since we knew the sommelier that day (Matt Stamp) I believe he upgraded our service as a few courses arrived that were not listed, including the coffee and doughnuts. It was quite the dining experience at 4 1/2 hrs (Saturday lunch). I found fewer faults in the food, but perhaps I was simply overwhelmed by the heady atmosphere and attentive service. It’s nice to check out your blog and read your impressions. Great photos & fun food info! Hey, I hope you don’t mind that I’m using your picture of TFL in the dark as my cover photo on facebook. If you do not want me to, please email or reply here me and I’ll remove it ASAP.